One of my dear clients, Brendon, has done superbly well on his diet plan. 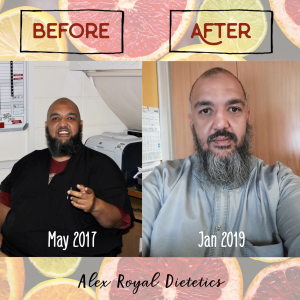 He lost a whopping 17kg! 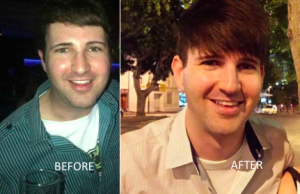 He shares the good, the bad and the ugly of the diet and his AMAZING transformation! Alex: How much weight have you lost in total? Alex: What was the most difficult part of the diet plan? Brendon: The hardest part was learning to cut down on portion sizes, stopping eating constantly just for the sake of it as well as being disciplined to eat healthier when having/going out for dinner such as ordering salad or veg instead of chips with a burger/steak. Also being disciplined to maintain ones weight/eating plan once weight goal has been reached. Alex: What was the easiest? Alex: Can you share some tips and give advice to others in your shoes, just starting the diet plan? Brendon: In terms of any tips…don’t think that by going to dietitian you will be made to starve and not be allowed anything such as carbs, good bread etc…portion control is what I found to make the biggest difference. Try setting an end date/goal for trying to achieve the weight loss…as you know I wanted to lose weight for my sister’s wedding so I made this my goal. Further tips (excuse the essay) would just be to do things smartly and healthily and don’t try starve yourself to reach your goal quicker. Hi Alex, thanks for making me thin, Darryl likes me this way! Thanks for the eating plan, I’ve lost 7 kilo’s thus far and feeling great!